FinBee is an online lending platform created in 2015. Our goal is to become the leading peer-to-peer lending company in Lithuania and to achieve rapid development in foreign markets. FinBee operating platform was created using the software of Madiston P2P lending model. This technical solution allows FinBee to provide professional P2P lending services. All financial transactions between investors and borrowers are performed through Clients’ Money Account (CMA) in a well known bank in the Baltic States – “Citadele”. FinBee Bank account in “Citadele” bank is a secure deposit bank account where your deposits up to 100 thousand euros are fully insured by Lithuanian government. (Insurance does not cover risks for investments in loans). JSC “Finansu Bite” is listed in the Bank of Lithuania’s loan lenders and peer-to-peer lending operator list. Also, FinBee is included in Personal Data Controllers public register. FinBee is a a peer-to-peer (P2P) lending and investment platform that connects those who want to borrow with those who are looking for diverse investment opportunities. Press the link here and provide your Personal Information to register in FinBee. After the first deposit your bank account will be linked to your FinBee account. This means that deposits will be accepted and withdrawals will be made to your linked bank account only. When you set up this transfer with your bank, you must include the unique reference as shown above. There are no fees applied for deposits or withdrawals by FinBee. Please note, that the money will take from a couple of hours to one working day to transfer. Peer-to-peer lending are vulnerable to the investment risks as well as other financial instruments. Before investing into unsecured loans, you must evaluate your personal and family finances as well as your business financial situation. Your investments through FinBee platform are not insured or secured in any other way. In addition, there is no guarantee that a borrower will meet his financial commitments. It is lender’s responsibility to choose a loan and to determine the risk. FinBee is not responsible for insolvent clients. However, we are here to help you to measure your risk and to find creditworthy clients. There are no hidden fees or charges in our activities. You will know exactly which fees will be applicable to you. FinBee uses a 1% commission for your investment portfolio if you decide to sell it to another investor. What are debt collection fee? When borrowers’ payments are overdue or they default on the loan, FinBee applies the best practices in the banking sector in debt collection. There are no additional fees for it. Allcollected money is transferred to lenders. The smalest investment in any single loan is 5 Eur. We recommend investing each loan in small portions. This means that you do not have to finance whole sum of a loan that borrowers apply for. We advise investing each loan in small amount of money. Thus, if borrower defaults a lender will experience less damage to his loan portfolio. We advise to start lending small amounts of money, evaluating and understanding the principles of FinBee operation as well as investment risk and only then start lending significantly larger amounts. What will happen in case FinBee would go bankrupt? All investors’ funds are held in Clients’ Money Account (CMA) in Citadele bank. All investors deposits are investors’ personal property and are fully insured by Lithuanian government up to 100 thousand euros individually. This CMA account is strictly separated from JSC “Finansu Bite” assets. Borrowers also pay their monthly installments to this CMA account, so all monthly installments will be transferred to investors according to payment schedule in case FinBee goes bankrupt. FinBee has prepared and coordinated the Plan of Business continuity with The Bank of Lithuania (Central bank of Lithuania). According to the Plan, new administrator will take over administration of all active loan agreements in case FinBee goes bankrupt. The main purpose of the Plan is to protect all investors’ rights in case of bankruptcy. How can I contact FinBeeVerslui? Who can borrow in FinBeeVerslui platform? What are the fees for the borrowers on FinBeeVerslui platform? The amount of the fees depends on each case. The credit score, amount of the loan, term and different type of the pledge. How long will it take to get the funds after the application is sent? It takes us 1 day to make a decision on granting the loan. If our offer is suitable for you, we will transfer money on the same day. Is it possible to repay some or all of the loan in advance? Yes, the loan in full or in part can be returned in advance. What happens if I delay any loan payment? Please contact us immediately if you think that you will not be able to pay the monthly fee or return the loan on time. If you delay your monthly fee or the loan repayment, we or debt collection company working with us will contact you to find out the reasons and take steps to put forth the overdue payment. If the monthly fee or the loan repayment is delayed for more than 3 days, you will be charged with insolvent administration fee and any other insolvent administration-related costs (litigation, etc.). If you delay to pay more fees then the loan contract will be terminated unilaterally. We or our partners will take actions to recover the amounts due under the credit agreement. Fill out the application for the loan (it takes from 1 to 2min) “The application for the loan“. It is easier, cheaper and faster to borrow on our platform. All the operations related to the loan are processed electronically. When you complete the application, you can get the loan on the same working day. Our professional specialists are always here to help you. To invest through FinBee, investors must be at least 18 years old, have a bank account in European Union and have valid personal document. Once you create your account in FinBee first of all you have fill Client questionnaire. (All data provided is confidential and will not be publicly announced to third parties. After the questionnaire is confirmed by manager you need to add funds on your account to start investing). How much time it takes to withdraw money from FinBee? The money will take from a couple of hours to one working day to transfer, depending on the method that your bank uses and when you put the request to the bank. What is AutoLend and how it work? The AutoLend facility is designed to enable lending on a larger scale and with more sophistication than is feasible by manually searching and selecting loan requests, and borrowers, and then manually placing bids on those loan requests. Via a lending portfolio, AutoLend enables automatic bidding. AutoLend will automatically place lending bids on loan requests selected according to the lending portfolio parameters. Up to five different lending portfolios may be created by the lender each configured by different available AutoLend parameters. This enables lenders to lend on a portfolio basis setting borrower credit ratings, borrower ages, interest rates and lending amounts. This enables lending in larger volume and in a more structured manner than is feasible making manual lending bids on specific loan requests. Each portfolio is designed to provide proposals into one loan only once, but if the loan request is in the line with several portfolios created settings, all portfolios will start to lend to the same loan. More about AutoLend settings here. In the secondary market you can buy existing loan parts from other lenders. This way you can start earning interest right away and spread the risk in your loan portfolio across more borrowers. As a buyer you are paying for the right to take the repayments due to the seller at the same nominal rate originally agreed with the borrower. You can also sell your loan parts in the secondary market. More about secondary market here. No. Once you have confirmed your investment, you cannot cancel it. But you can always use the secondary market to sell your loan parts. How to withdraw money from FinBee? Log in to your FinBee account. Press the „Pay In and Withdraw Money“. After that press „Withdrawal“ button. Please enter the amount that you wish to withdraw. Requested amount will be transfered into your bank account. Which risks must be taken into consideration before lending the money on peer-to-peer lending platform? FinBeeVerslui clearly understands that the investors have trust in our platform and they expect high financial return. That’s why we pay a lot of attention for solvent clients research, customers’ verification and risk management processes. Your investments on FinBee platform are not insured or secured in any other way. In addition, there is no guarantee that a borrower will meet his financial commitments. If you decide to withdraw the invested funds before the borrower must return it, you can do this by offering other investors to buy your loan investments. It is possible that you’ll have to sell your investments with a discount or won’t sell them at all. It depends on the demand of other investors. We aim to achieve excellency in credit scoring and evaluate precisely the chance of default. We have compared business loans’ (FB-V) to private loans’ (FB-P) default rates and we came to conclusion that the current business and private loans scoring is not matching and that makes it more difficult to make a decision where to invest for our investors. Current private loans’ credit score will remain the same. 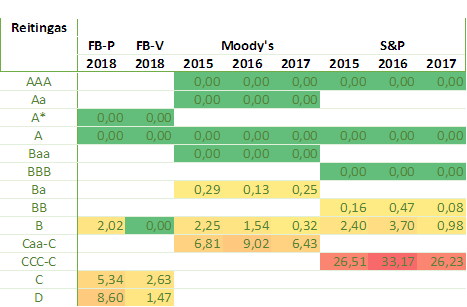 We have also compared business and private loans’ credit score to international credit rating agencies Standart and Poor‘s and Moody’s default rates (comparison below). How do I pay my income tax if I am resident of Lithuania? According to the legal requirements, FinBee submits information about your earned interest to State Tax Inspection of the Republic of Lithuania (Lith. Valstybinė mokesčių inspeckija). You will find submitted information on your yearly income declaration and will have to pay an income tax of 15 percent. Please note that from January 1st 2018, income tax is deducted only from earned interest that exceeds 500 euros per year. How do I pay my income tax if I am non-resident of Lithuania? According to Income Tax Law of the Republic of Lithuania, FinBee is responsible for the collection and payment of income tax for non-residents. The income tax rate is 15 percent and it is deducted from earned interest. The platform automatically deducts it every time when loan installment is received. If you are non-resident of Lithuania and you are living in a country which has valid Double Taxation Avoidance Treaty with Lithuania, you can apply for the reduced personal income tax rate. Please contact us by e-mail for further instructions how to apply the reduced personal income tax rate. What taxes must be paid by the individuals, who invest in legal entities or individual's loans through FinnBeeVerslui platform? Residents of Lithuania lending the money to legal entities through peer to peer lending platform must pay the income tax for interest received (class B income). That means the investor receiving any interest is fully responsible for accounting and paying the income tax. Received interest must be declared by the investor or legally responsible person through GPM308 form in the annual tax declaration. The whole amount of the interest is taxed 15%. FinbeeVerslui will provide the data required to fill in the tax declaration. Fines and penalties for contractual default or delay paid to the lender, are not considered interest. What declarations must be provided by legal entities investing in legal entities loans? Legal entity registered in the Republic of Lithuania that lent the money for another legal entity registered in the Republic of Lithuania does not need to provide the information about the loan to the State Tax Inspectorate (VMI). – Non-Lithuanian legal entity is registered or organised in any other way in European Economic Area (EEA) or in a country that uses double taxation convention (list of the countries). What declarations must be provided by legal entities investing in individual’s non-consumer loans? Legal entities registered in the Republic of Lithuania, investors, must provide correctly filled FR0711 form until April 15 of the upcoming year with the information about the loans over 600 Euro provided for individuals over the previous calendar year. In addition, the information about payments of any amount received over the calendar year must be provided. FinbeeVerslui will provide the data required to fill in the declaration. What declarations must be provided by the borrowers using FinbeeVerslui peer to peer lending platform? Legal entities registered in the Republic of Lithuania that receive the loan must provide correctly filled tax declaration form FR0711 with the information of previous calendar year about received loans of 600 Euros and above. The repayments of any amount made must be reported in the form too. FinbeeVerslui will provide the data required to fill in the form. How much does it cost to invest on FinBeeVerslui platform? Investors use our platform completely free of charge. The only fee we apply is 1% charge for any selling transactions in the secondary market. How to appeal to the supervisory authorities (FinBeeVerslui) ? You can learn here, how to submit a complaint to the Bank of Lithuania. You can learn here, how to submit a complaint to the State Data Protection Inspectorate.